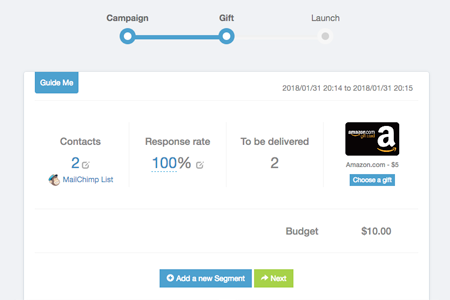 - Select MailChimp Integration first. - Input the campaign name and choose the type of gift you want to send. (Subscribers would be able to access his gift only during this period). This will set the quantity of contacts to gift. It is creating as many access (Gift-Links) as subscribers registered into the segment. Enter your predictable response rate (optional) to calculate the minimum number of gifts you need to satisfy the demand. (Not everyone will claim his gift during your campaign, it is up to you to calculate returns rate to optimize your deliveries. You will be notified during the campaign of the evolution of your real deliveries versus the estimates, and then you could adjust the numbers during the campaign). The response rate is a ratio (it is a percentage calculation between the numbers of contacts and the total of subscribers). Select the gift you want to offer to subscribers. Then, fix the value of the gift you want to offer by double clicking on the selected e-gift. If you choose prepaid e-gift cards, you will need first to credit your balance account to purchase the gift cards. Check the details of your campaign and click on the Apply button. 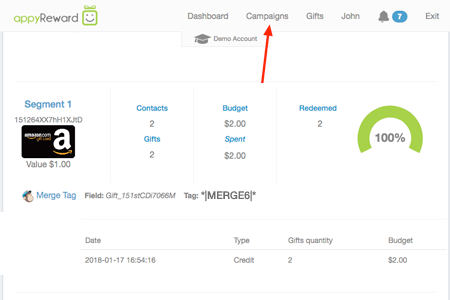 Once your campaign is activated, appyReward automatically creates a new list field by importing unique gift links for each subscriber. The Campaign activation will display the name of the Merge Tag. 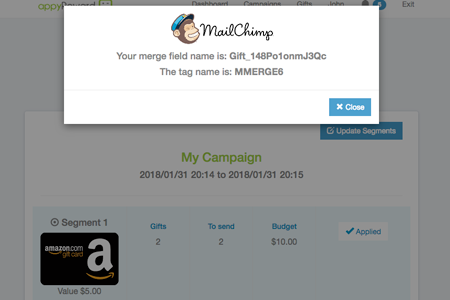 Use that field's Merge Tag into your MailChimp Template. On the Design step, click the content block where you want the Gift Link to appear. 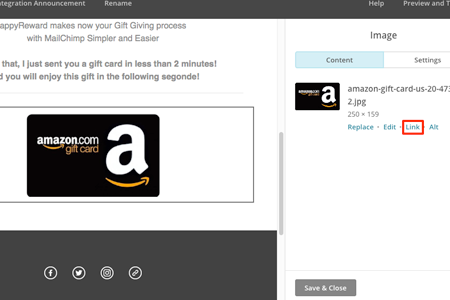 Highlight the text or select your image you want to link to the Gift, and click the link icon. 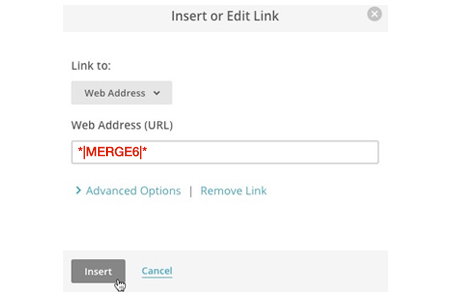 In the Insert or Edit link pop-up modal, input your new field's merge tag in the Web Address (URL) field. Type the full merge tag, exactly as it appears in your List Settings. 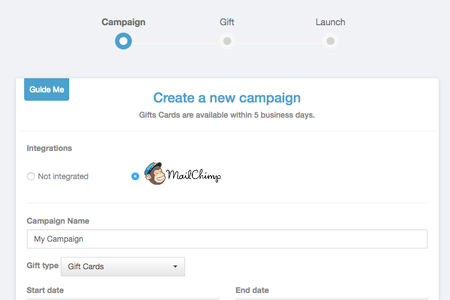 MailChimp will replace the Merge Tag with the Gift-Link from the list field. From the Campaign list, you will have a high-level overview of all your campaigns. You can also check in real-time the results of each campaign. By clicking "more details" you will get the number (real-time) of recipients that have redeemed e-gifts. 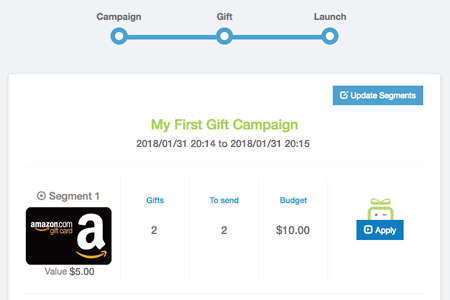 If you added prepaid gift cards to your campaign, it would be then displayed the total amount spent (real-time) during the campaign. CHOOSE AN E-GIFT CARD FROM OUR CATALOG! Select the quantity you need times the gift price (that you pay only at its face value). To order you need to credit your account in excess of such amount. PAY FOR THE RIGHT PRICE! Gift cards that are not claimed by recipients at the end of the campaign would not be invoiced, but reversed into your account to be used on your next campaign. For security reasons, your account will be verified promptly by our team. Once validated, you will receive a confirmation email. 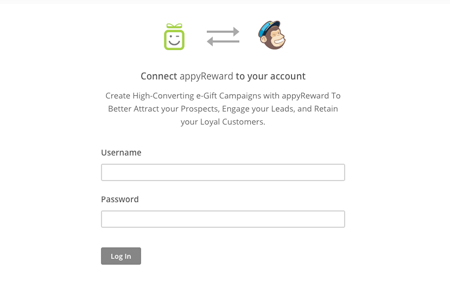 appyReward Application is a Software as a service (Saas) application used by companies for incentives and rewards programs with customers, partners, employees, and users. Subscriber must be at least eighteen (18) years of age to use the appyReward Application. By agreeing to this Agreement, Subscriber represents and warrants to appyReward: (i) that Subscriber is at least eighteen (18) years of age; (ii) that Subscriber has not previously been suspended or removed from the appyReward Application; and (iii) that Subscriber’s registration and Subscriber’s use of appyReward is in compliance with any and all applicable laws and regulations. If you are using the appyReward Application on behalf of an entity, organization, or company, you represent and warrant that you have the authority to bind such organization to this Agreement and you agree to be bound by this Agreement on behalf of such organization, which is the Subscriber under this Agreement. 2.1 “Documentation” means appyReward -provided user documentation, in all forms, relating to appyReward Application (e.g., user manuals, on-line help files). 2.2 “Gift-Card” or “Reward” or “Digital Gift-Card or Reward” means a digital gift-card and/or reward that is purchased and downloaded by Subscriber via the appyReward Application and can be redeemed to make purchases at a Merchant. 2.3 “Reward Terms” means the additional terms governing the downloading of Digital Gift-Cards or Rewards that can be updated by appyReward from time to time. 2.4 “Reward Pricing” means appyReward’s standard pricing table listing the fees and pricing for the different offerings of appyReward located at [www.appyreward.com/pricing], as may be updated by appyReward from time to time. 2.5 “appyReward Application” means appyReward’s web-based digital rewards platform that enables the sending of customizable and trackable Digital Gift-Cards or Rewards. 2.6 “Merchant” means a business that offers Digital Gift-Cards or Rewards that can be purchased by Subscriber and sent to Recipients using the appyReward Application. 2.7 “Order Form” means an appyReward order form executed by both parties and specifying any additional terms and conditions applying to Subscriber’s use of the appyReward Application. 2.8 “Recipient” means a recipient of one or more Digital Gift-Cards or Rewards sent by Subscriber using the appyReward Application. 2.9 “Use Data” means any data or information other than Subscriber Data that is collected by appyReward as a result of Subscriber’s access to or use of the appyReward Application or any Recipient’s interactions with Gift-Card and Reward offers. 2.10 “Subscriber Data” means any data or information provided by or on behalf of Subscriber to appyReward, in connection with Subscriber’s use of the application. 3.3 Use Restrictions. Except as otherwise explicitly provided in this Agreement or as may be expressly permitted by applicable law, Subscriber will not, and will not permit or authorize third parties to: (a) reproduce, modify, translate, enhance, decompile, disassemble, reverse engineer, or create derivative works of the appyReward Application; (b) rent, lease, or otherwise permit third parties to use the appyReward Application or Documentation; (c) use the appyReward Application to provide services to third parties; nor (d) circumvent or disable any security or other technological features or measures of the appyReward Application. 3.4 Compliance with Laws. Subscriber will use appyReward Application in compliance with the Reward Terms and all applicable laws and regulations. Individual terms, conditions and limitations may apply for Digital Gift-Cards or Rewards. We have made every reasonable effort to include such terms, conditions and limitations on this Site, but these may change from time to time without notice. It is your responsibility to check any terms, conditions or limitations which may apply with the brand owner of the Digital Gift-Cards or Rewards. 3.5 Subscriber Content. Certain features of appyReward may allow Subscriber to upload content, including messages, photos, video, images, folders, data, text, and other types of works (collectively, “Subscriber Content”) and to publish Subscriber Content through the appyReward Application. Subscriber retains copyright and any other proprietary rights that Subscriber may hold in the Subscriber Content. Subscriber grants appyReward a worldwide, non-exclusive, royalty-free right and license (with the right to sublicense) to host, store, transfer, display, perform, reproduce, modify, and distribute the Subscriber Content, in whole or in part, in any media formats and through any media channels (now known or hereafter developed). 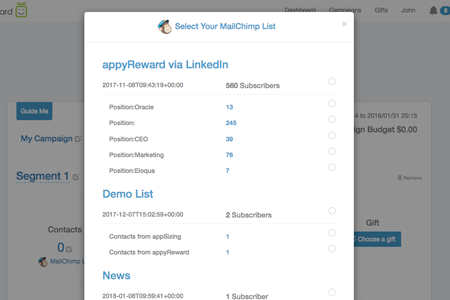 Any use of the Subscriber Content by appyReward will be without any compensation paid to Subscriber. Subscriber is solely responsible for Subscriber Content and the consequences of posting or publishing Subscriber Content. By posting or publishing Subscriber Content, Subscriber represents and warrants that (a) Subscriber is the creator and owner of, or has the necessary licenses, rights, consents, and permissions to use and to authorize appyReward to use and distribute the Subscriber Content as necessary to exercise the licenses granted by Subscriber and in the manner contemplated by appyReward and this Agreement; and (b) the Subscriber Content, and the use thereof as contemplated herein, does not and will not: (i) infringe, violate, or misappropriate any third-party right, including any copyright, trademark, patent, trade secret, moral right, privacy right, right of publicity, or any other intellectual property or proprietary right; or (ii) slander, defame, or libel any third-party. 3.6 Subscriber Content Disclaimer. appyReward is under no obligation to edit or control Subscriber Content that Subscriber or other users post or publish, and will not be in any way responsible or liable for Subscriber Content. appyReward may, however, at any time and without prior notice, screen, remove, edit, or block any Subscriber Content that in appyReward’s sole judgment violates this Agreement or is otherwise objectionable. Subscriber understands that when using the appyReward Application Subscriber may be exposed to Subscriber Content from a variety of sources and acknowledge that Subscriber Content may be inaccurate, offensive, indecent or objectionable. Subscriber agrees to waive, and hereby does waive, any legal or equitable rights or remedies Subscriber have or may have against appyReward with respect to Subscriber Content. appyReward expressly disclaims any and all liability in connection with Subscriber Content. If notified by a user or content owner that Subscriber Content allegedly does not conform to this Agreement, appyReward may investigate the allegation and determine in its sole discretion whether to remove the Subscriber Content, which appyReward reserves the right to do at any time and without notice. For precision, appyReward does not permit copyright-infringing activities on the appyReward Application. 3.7 Protection against Unauthorized Use. Subscriber will use reasonable efforts to prevent any unauthorized use of the appyReward application and immediately notify appyReward in writing of any unauthorized use that comes to Subscriber’s attention. If there is unauthorized use by anyone who obtained access to the appyReward Application directly or indirectly through Subscriber, Subscriber will take all steps reasonably necessary to terminate the unauthorized use. Subscriber will cooperate and assist with any actions taken by appyReward to prevent or terminate unauthorized use of the appyReward Application or Documentation. 3.8 Prohibited Conduct. By using the appyReward Application, SUBSCRIBER AGREES NOT TO: (a) use the appyReward Application for any illegal purpose, or in violation of any local, state, national, or international law; (b) violate, or encourage others to violate, the rights of third parties, including by infringing or misappropriating third party intellectual property rights; (c) post, upload, or distribute any Subscriber Content or other content that is unlawful, defamatory, libelous, inaccurate, or that a reasonable person could deem to be objectionable, profane, indecent, pornographic, harassing, threatening, embarrassing, hateful, or otherwise inappropriate; (d) interfere with security-related features of the appyReward Application, including without limitation by disabling or circumventing features that prevent or limit use or copying of any content, or reverse engineering or otherwise attempting to discover the source code of the appyReward Application or any part thereof except to the extent that such activity is expressly permitted by applicable law; (e) interfere with the operation of the appyReward Application or any user’s enjoyment of the appyReward Application, including without limitation by uploading or otherwise disseminating viruses, adware, spyware, worms, or other malicious code, making unsolicited offers or advertisements to other users of appyReward, attempting to collect, personal information about users or third parties without their consent; or interfering with or disrupting any networks, equipment, or servers connected to or used to provide the appyReward Application, or violating the regulations, policies, or procedures of such networks, equipment, or servers; (f) perform any fraudulent activity including impersonating any person or entity, claiming false affiliations, accessing the appyReward Application accounts of others without permission, or falsifying Subscriber’s age or date of birth; (g) sell or otherwise transfer the access granted herein or any Materials or any right or ability to view, access, or use any Materials. 3.9 Third-Party appyReward Application. appyReward may provide tools through the appyReward Application that enable Subscriber to export information, including Subscriber Content, to third party services, including through features that allow Subscriber to link the Subscriber Account with an account on the third party service, such as Twitter or Facebook, or through our implementation of third party buttons (such as “like” or “share” or “comments” buttons). By using these tools, Subscriber agrees that we may transfer such information to the applicable third-party service. Such third party services are not under our control, and we are not responsible for their use of Subscriber’s exported information. 3.10 Linked Websites. The appyReward Application may also contain hyperlinks to third-party websites. Such linked websites are not under our control, and we are not responsible for their content or your use of them. The appyReward Application's inclusion of hyperlinks to such websites does not imply any endorsement of the material on such websites or any association with their operators. 3.11 Proprietary Rights. The appyReward Application and Documentation are owned and operated by appyReward. The visual interfaces, graphics, design, compilation, information, data, computer code (including source code or object code), products, software, services, and all other elements of the appyReward Application (the “Materials”) provided by appyReward are protected by all relevant intellectual property and proprietary rights and applicable laws. All Materials contained in the appyReward Application are the property of appyReward or its third-party licensors. Except as expressly authorized by appyReward, Subscriber may not make use of the Materials. appyReward reserves all rights to the Materials not granted expressly in this Agreement. 3.12 Merchant Terms and Conditions. Subscriber agrees and acknowledges that each Digital Gift-Card or Reward sent via the appyReward Application is subject to additional terms and conditions issued by the applicable Merchant. In the event of a conflict between the terms of this Agreement and the Merchant terms governing a Digital Gift-Card or Reward, the Merchant terms will prevail solely with respect to the purchase, issuance, redemption, and other use or exploitation of the Gift-Card or Digital Reward. Subscriber is solely responsible for reviewing any and all applicable Merchant terms prior to purchasing the Digital Gift-Cards or Rewards from the Merchant. 4.1 Subscriber Account. Subscriber will be required to register an account with the appyReward Application (“Subscriber Account”). Subscriber agrees to provide accurate information to appyReward in connection with the registration process and keep the information accurate and up-to-date at all times. Subscriber is solely responsible for maintaining the confidentiality of its account and password. Subscriber agrees to accept responsibility for all activities that occur under the Subscriber Account, and will immediately notify appyReward if it has reasonable belief that the Subscriber Account is no longer secure. 4.2 Funding Subscriber Account. Subscriber must purchase credit for the appyReward Application by funding the Subscriber Account in accordance with the payment terms described in Section 4.4. Payments for any applicable operational fees (monthly to yearly subscriptions) for the appyReward Application and all prepaid Digital Gift-Cards and Rewards that Subscriber sends to Recipients will be debited from the Subscriber Account. 4.3 Purchasing Prepaid Digital Gift-Cards and/or Rewards. The appyReward Application allows Subscriber to offer prepaid Digital Rewards and Gift-Cards to Recipients and to purchase these prepaid Digital Gift-Cards and Rewards that Recipients claim. 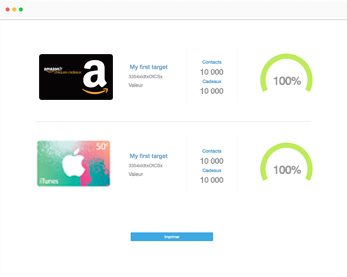 When Subscriber offers a Gift-Card or a Digital Reward to a Recipient, the then-current balance of the Subscriber Account (“Account Balance”) will be distributed for the order amount (“Distributed Amount”) pending claiming of the Gift-Card or Digital Reward by the Recipient or expiration of the Digital Gift-Card or Reward offer. 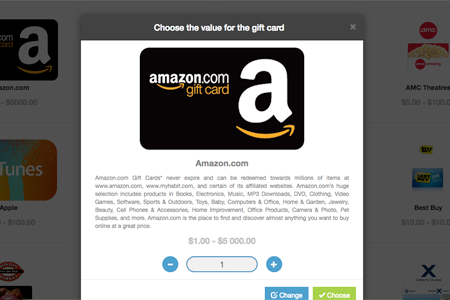 If the Recipient claims the Digital Gift (“Download Reward”), the Distributed Amount is debited in the amount of the Gift-Card or the Digital Reward. If Subscriber cancels the Gift-Card or the Digital Reward prior to its redemption by the Recipient or if the Digital Gift-Card or Reward offer expires prior to its claim, the Distributed Amount—minus any applicable appyReward operational fees—will be refunded to the Account Balance. 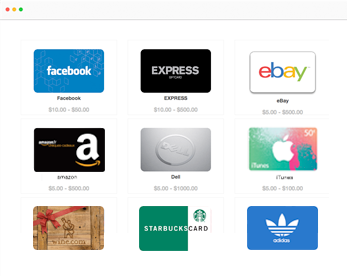 The Distributed Amount of each Gift-Card or Digital Reward is non-refundable once the Recipient claims the Digital Gift (“Gift Code”). For accuracy, a Recipient claims a Gift-Card or a Digital Reward once the Recipient accepts the offer from Subscriber and downloads the Gift Code, irrespective of whether the Recipient uses the Gift Code to make purchases from a Merchant. Subscriber must have an Account Balance in excess of any desired purchase amounts in order to make the purchase. 4.4 Fees and Payment Terms. Subscriber will pay appyReward the fees and any other amounts owing under this Agreement, plus any applicable sales, use, excise, or other taxes, in accordance with the then-current appyReward Pricing Table. Subscriber can fund the Subscriber Account via credit cards, ACH, wire transfer of immediately available funds, or other form of payment agreed by appyReward, using the payment instructions provided on the appyReward Pricing Table. The Account Balance will only be updated, and paid amounts will only be available for use, once the payments are processed and credited to the Subscriber Account. Subscriber understands that the processing of payments relies on third parties beyond appyReward’s control and amounts paid may not be immediately available for use on the appyReward Application. Gift-Cards and Digital Rewards can be denominated in either U.S. dollars ($) or euros (€) so long as Subscriber has funded the Subscriber Account in the currency he wishes to send the Digital Gift-Cards or Rewards and the Account Balance in such currency exceeds the amount of Gift-Cards or Digital Rewards that Subscriber wishes to offer in such currency. Subscriber will pay all fees incurred by appyReward for accepting payment via credit cards, ACH, wire, or other agreed upon payment method. All sums payable to appyReward shall be paid in full by Subscriber, without deducting or allowing the deduction of any currency conversion, wire transfer, remittance or other charges relating to the payment (or any handling of the payment) thereof. 4.5 Taxes. Subscriber will bear all taxes, duties, VAT if any (Gift-Cards are generally VAT exempt), and other governmental charges (collectively, “taxes”) resulting from this Agreement or the purchase of Gift-Cards or Digital Rewards from Merchants. Subscriber will pay any additional taxes as are necessary to ensure that the net amounts received by appyReward after all such taxes are paid are equal to the amounts that appyReward would have been entitled to in accordance with this Agreement as if the taxes did not exist. 5.1 Subscription Term. This Agreement will commence upon the Effective Date of subscription and continue unless this Agreement is terminated earlier in accordance with the terms of this Agreement. The Subscription fees, if any, will automatically renew for additional successive terms unless at least, either party provides written notice via email (5 days for 1 month term - 60 days for 1-year terms) before the end of the then-current term to the other party that it does not want to renew. 5.2 Termination for Convenience. Subscriber may terminate this Agreement at any time by cancelling the Subscriber Account using the settings functions in the appyReward Application or by emailing legal@appyreward.com from the email address associated with the Subscriber Account. 5.3 Termination of Use; Discontinuation and Modification of the appyReward Application. If Subscriber violates any provision of this Agreement, Subscriber’s permission to use the appyReward Application will terminate automatically. Additionally, appyReward, in its sole discretion may terminate Subscriber’s Subscriber Account or suspend or terminate Subscriber’s access to the appyReward Application at any time, with or without notice. appyReward also reserves the right to modify or discontinue the appyReward Application at any time (including, without limitation, by limiting or discontinuing certain features of the appyReward Application) without notice to Subscriber. appyReward will have no liability whatsoever on account of any change to the appyReward Application or any suspension or termination of Subscriber’s access to or use of the appyReward Application. 5.4 Termination for Material Breach. Either party may terminate this Agreement if the other party does not cure its material breach of this Agreement within 30 days of receiving written notice via email of the material breach from the non-breaching party. If Subscriber fails to timely pay any fees, appyReward may, without limitation to any of its other rights or remedies, suspend performance of the appyReward Application until it receives all amounts due. 5.5 Post-Termination Obligations. If this Agreement is terminated for any reason, (a) appyReward will refund the Account Balance within 30 days of termination; (b) any outstanding offers of Gift-Cards or Digital Rewards that have not been claimed at the time of termination will remain in effect until either claimed by the applicable Recipient or the offer expires or is cancelled by Subscriber; (c) Gift-Card or Digital Reward offers that expire or are cancelled after the termination of this Agreement will be refunded to Subscriber, minus any applicable appyReward Application fees, and (d) any and all liabilities accrued prior to the effective date of the termination will survive. appyReward reserves the right, at its discretion, to change this Agreement on a going-forward basis at any time. Please check this Agreement periodically for changes. In the event that a change to this Agreement materially modifies Subscriber’s rights or obligations, appyReward will make reasonable efforts to notify Subscriber of such change. 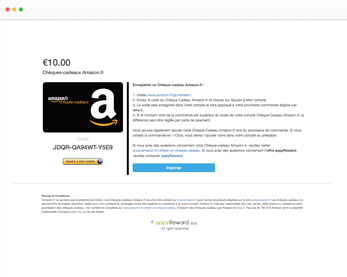 appyReward may provide notice within the appyReward Application, by sending an email to any address Subscriber may have used to register for an account, or through other mechanisms. If Subscriber does not accept the changed terms and conditions, we may terminate Subscriber’s access to and use of the appyReward Application. All other changes are effective upon publication of the changed terms and conditions. Disputes arising under this Agreement will be resolved in accordance with the terms and conditions in effect that the time the dispute arose. 7.1 Mutual Warranties. Each party represents and warrants to the other that: (a) this Agreement has been duly executed and delivered and constitutes a valid and binding agreement enforceable against such party in accordance with its terms; and (b) no authorization or approval from any third party is required in connection with such party’s execution, delivery, or performance of this Agreement. 7.2 Digital Gift-Card or Reward Warranties. appyReward agrees to supply Subscriber with Gift-Cards he selected subject to availability. This Agreement is limited to the supply of the requested Digital Gift-Cards or Rewards. appyReward in no way guarantees or warrants the availability of the goods and service to which a particular voucher pertains, and is in no way liable for damages, consequential or otherwise, arising from redeeming the Gift-Cards supplied by us in return for goods and services. 7.3 Disclaimer. APPYREWARD EXPRESSLY DISCLAIMS ALL IMPLIED WARRANTIES OF MERCHANTABILITY, ACCURACY, TITLE, AND NON-INFRINGEMENT. APPYREWARD DOES NOT WARRANT AGAINST INTERFERENCE WITH THE USE OF THE APPYREWARD APPLICATION. APPYREWARD DOES NOT WARRANT THAT THE APPYREWARD APPLICATION IS ERROR-FREE OR THAT OPERATION OF THE APPYREWARD APPLICATION WILL BE SECURE OR UNINTERRUPTED. APPYREWARD DOES NOT WARRANT THAT ANY INFORMATION PROVIDED THROUGH THE APPYREWARD APPLICATION IS ACCURATE OR COMPLETE OR THAT ANY INFORMATION PROVIDED THROUGH THE APPYREWARD APPLICATION WILL ALWAYS BE AVAILABLE. APPYREWARD EXERCISES NO CONTROL OVER AND EXPRESSLY DISCLAIMS ANY LIABILITY ARISING OUT OF OR BASED UPON THE RESULTS OF SUBSCRIBER’S USE OF THE APPYREWARD APPLICATION. 8.1 Defense of Infringement Claims. appyReward will, at its expense, either defend Subscriber from or settle any claim, proceeding, or suit (“Claim”) brought by a third party against Subscriber alleging that Subscriber’s use of the appyReward Application infringes or misappropriates any United States or Union European patent or registered copyright during the term of this Agreement if: (a) Subscriber gives appyReward prompt written notice of the Claim; (b) Subscriber grants appyReward full and complete control over the defense and settlement of the Claim; (c) Subscriber provides assistance in connection with the defense and settlement of the Claim as appyReward may reasonably request; and (d) Subscriber complies with any settlement or court order made in connection with the Claim (e.g., relating to the future use of any infringing appyReward Application). Subscriber will not defend or settle any Claim without appyReward’s prior written consent. Subscriber will have the right to participate in the defense of the Claim at its own expense and with counsel of its own choosing, but appyReward will have sole control over the defense and settlement of the Claim. 8.2 Exclusions from Obligations. appyReward will have no obligation for any infringement or misappropriation arising out of or based upon (a) use of the appyReward Application in combination with other products or services if such infringement or misappropriation would not have arisen but for such combination; (b) the appyReward Application or custom services are provided to comply with designs, requirements, or specifications required by or provided by Subscriber, if the alleged infringement or misappropriation would not have arisen but for the compliance with such designs, requirements, or specifications; (c) use of the appyReward Application by Subscriber for purposes not intended or outside the scope of the license granted to Subscriber; (d) Subscriber’s failure to use the appyReward Application in accordance with instructions provided by appyReward, if the infringement or misappropriation would not have occurred but for such failure; (e) any of the Subscriber Content; or (f) any modification of the appyReward Application not made or authorized in writing by appyReward where such infringement or misappropriation would not have occurred absent such modification. 9.1 Defense. Subscriber will defend appyReward from any actual or threatened third party Claim arising out of or based upon (a) Subscriber’s use of the appyReward Application; (b) Subscriber's breach of any of the provisions of this Agreement; or (c) the alleged infringement or misappropriation of any third party right by the Subscriber Content. appyReward will: (i) give Subscriber prompt written notice of the Claim; (ii) grant Subscriber full and complete control over the defense and settlement of the Claim; (iii) provide assistance in connection with the defense and settlement of the Claim as Subscriber may reasonably request; and (iv) comply with any settlement or court order made in connection with the Claim. appyReward will not defend or settle any Claim without Subscriber’s prior written consent. appyReward will have the right to participate in the defense of the Claim at its own expense and with counsel of its own choosing, but Subscriber will have sole control over the defense and settlement of the Claim. 9.2 Indemnification. Subscriber will indemnify appyReward from and pay (a) all damages, costs, and attorneys’ fees finally awarded against appyReward in any Claim; (b) all out-of-pocket costs (including reasonable attorneys’ fees) reasonably incurred by appyReward in connection with the defense of a Claim (other than attorneys’ fees and costs incurred without Subscriber’s consent after Subscriber has accepted defense of the Claim); and, (c) all amounts that Subscriber agrees to pay to any third party to settle any Claim. 10.1 Disclaimer of Indirect Damages. Notwithstanding anything to the contrary contained in this Agreement, appyReward will not, under any circumstances, be liable to Subscriber for consequential, incidental, special, or exemplary damages arising out of or related to this Agreement, including but not limited to lost profits or loss of business, even if appyReward is apprised of the likelihood of such damages occurring. 10.2 Cap on Liability. under no circumstances will appyReward’s total liability of all kinds arising out of or related to this Agreement (including but not limited to warranty claims), regardless of the forum and regardless of whether any action or claim is based on contract, tort, or otherwise, exceed the total amount paid by Subscriber to appyReward during the 12 months immediately preceding the claim (determined as of the date of any final judgment in an action). “Confidential Information” means any trade secrets or other information of a party, whether of a technical, business, or other nature (including information relating to a party’s technology, software, products, services, designs, methodologies, business plans, finances, marketing plans, customers, prospects, or other affairs), that is disclosed to a party during the term of this Agreement and that such party knows or has reason to know is confidential, proprietary, or trade secret information of the disclosing party. The parties agree that all Subscriber Data is the Confidential Information of Subscriber. Notwithstanding the foregoing, Confidential Information does not include any information that: (a) was known to the receiving party prior to receiving the same from the disclosing party in connection with this Agreement; (b) is independently developed by the receiving party without use of or reference to the Confidential Information of the disclosing party; (c) is acquired by the receiving party from another source without restriction as to use or disclosure; or (d) is or becomes part of the public domain through no fault or action of the receiving party. If either party is required by law to disclose the Confidential Information or the terms of this Agreement, the disclosing party must give prompt written notice of such requirement before such disclosure and assist the non-disclosing party in obtaining an order protecting the Confidential Information from public disclosure. 12.1 Collection of Use Data. Subscriber agrees and acknowledges that (a) the appyReward Application automatically log all user activity conducted on the appyReward Application, and (b) appyReward owns all right, title and interest in and to the Application Use Data. appyReward will not publicly disclose any Application Use Data in a manner that would reasonably likely identify Subscriber as being the source of such Use Data. 12.2 Subscriber Data. Subscriber owns all right, title and interest in and to the Subscriber Data. Subscriber hereby grants appyReward: (a) a nonexclusive, royalty-free, transferrable, worldwide license (with right to sublicense) to store, process, and otherwise use the Subscriber Data during the term of this Agreement (and for a reasonable amount of time after the term) in connection with the provision of the appyReward Hosted Services, any Custom Services, or as otherwise necessary or helpful to perform its obligations under this Agreement, and (b) a nonexclusive, royalty-free, perpetual, irrevocable, transferrable, worldwide license (with right to sublicense) to store, process and otherwise use the Subscriber Data in connection with the conduct by appyReward of its business operations; provided that it is never disclosed to any third party except in an aggregated or anonymous, de-identified form (i.e., in a form that cannot be used itself to identify Subscriber or its Clients). appyReward will at all times protect and maintain any Subscriber Data that constitutes the Confidential Information of Subscriber in accordance with Section 8; provided, however, that notwithstanding anything to the contrary herein, any Subscriber Data that is in an aggregated or anonymous, de-identified form (i.e., in a form that cannot be used itself to identify Subscriber) will not be considered to be the Confidential Information of Subscriber. 12.3 Personal Information. appyReward collects information about Subscribers for two reasons: (a) to process their order, and (b) to provide them with the best possible service. Your Personal Information will not, however, be used or disclosed for purposes for which you have not given consent or which are not permitted under EU and US applicable laws. In general We collect Personal Information about you from information you submit directly via the appyReward Application or the Site, such as your name, e-mail address, and date of birth, and from any social networking service whose platform you have used in order to connect to appyReward. When you make a purchase through appyReward, you will be required to submit your credit card or other payment information. All payments are subject to appropriate security and data protection measures. Additionally, we collect any information that you voluntarily enter, including Personal Information, into any postings, or comments within the appyReward Application. We are committed to protecting user privacy, Subscriber can check all information We hold about him and if he finds any inaccuracies he could delete or correct it promptly. We use a variety of industry-standard security technologies and procedures to help protect your Personal Information from unauthorized access, use, or disclosure. Even though we have taken significant steps to protect your Personal Information, no company, including Us, can fully eliminate security risks associated with Personal Information. 12.4 Cookies. We may use technology to provide you with a more personal and interactive experience with the appyReward Application. This can include using Cookies to gather information regarding the date and time of your visit and the information for which you searched and viewed, or clicked. This type of information is collected to make appyReward more useful to you; however you can usually modify your browser settings to disable Cookies and prevent this happening. Be aware that if you choose to disable Cookies, some aspects of the appyReward Application may not work properly. 13.1 Relationship. appyReward will be and act as an independent contractor (and not as the agent or representative of Subscriber) in the performance of this Agreement. 13.2 Assignability. Neither party may assign its right, duties, and obligations under this Agreement without the other party’s prior written consent, which consent will not be unreasonably withheld or delayed, except that a party may assign this Agreement without the other party’s consent to a successor (including a successor by way of merger, acquisition, sale of assets, or operation of law) if the successor agrees to assume and fulfill all of the assigning party’s obligations under this Agreement. 13.3 Subcontractors. appyReward may utilize a subcontractor or other third party to perform its duties under this Agreement so long as appyReward remains responsible for all of its obligations under this Agreement. 13.4 Force Majeure. Neither party will be liable for, or be considered to be in breach of or default under this Agreement on account of, any delay or failure to perform as required by this Agreement as a result of any cause or condition beyond its reasonable control, so long as that party uses all commercially reasonable efforts to avoid or remove the causes of non-performance. 13.5 Governing Law. This Agreement will be interpreted, construed, and enforced in all respects in accordance with the laws of the Grand-Duchy of Luxembourg that will govern these terms and conditions. 13.6 Severability. If any part of this Agreement is found to be illegal, unenforceable, or invalid, the remaining portions of this Agreement will remain in full force and effect. If any material limitation or restriction on the use of the appyReward Application under this Agreement is found to be illegal, unenforceable, or invalid, Subscriber’s right to use the appyReward Application will immediately terminate. 13.7 Counterparts. This Agreement may be executed in any number of identical counterparts, notwithstanding that the parties have not signed the same counterpart, with the same effect as if the parties had signed the same document. All counterparts will be construed as and constitute the same agreement. 13.8 Dispute Resolution. The Notice must (i) describe the nature and basis of the claim or dispute; and (ii) set forth the specific relief sought ("Demand"). The parties agree to use good faith efforts to resolve the claim directly within 30 days after the Notice is received. 13.10 Contact Information. The services hereunder are offered by appyReward – Via Download Sarl, located at 10, Boulevard Royal, L2449, Luxembourg. Subscriber may contact appyReward by sending correspondence to the foregoing address or by emailing appyReward at contact@appyreward.com. 13.11 Entire Agreement. This Agreement is the final and complete expression of the agreement between these parties regarding Subscriber’s use of the appyReward Application. This Agreement may be changed only by a written agreement signed by an authorized agent of the party against whom enforcement is sought.